Here's a list of the spices you'll encounter while cooking and baking Moroccan food. Spices are loosely ordered from those used most frequently to those used less often. You won't need all of these spices to begin making Moroccan dishes. For a better idea of what to have on hand for basic cooking, see Essential Spices. The vast majority of Moroccans use coarse salt for cooking. Reserve your iodized table salt for sprinkling on dishes after they’ve been cooked, and get in the habit of using kosher (coarse salt) or sea salt for cooking. Salt can vary in “saltiness” so err on the side of caution when using a new package or new brand of salt. Ground black pepper comes from the small, dried berries of the Piper nigrum plant. It is most flavorful and pungent when it is freshly ground, but it can be stored a very long time. White pepper comes from the same berries as black pepper, but only the inside kernel is ground. White pepper is milder than black pepper and is particularly good in sweeter Moroccan sauces impregnated with onions and saffron. Made from dried sweet red peppers, paprika is used in Moroccan cooking to season meat, cooked salads, bean dishes, some stews, and soups. Like its sweet counterpart, cayenne pepper or hot paprika is ground from dried peppers, although a spicier variety. Its use in Moroccan cooking is mostly optional and to taste. Cumin comes from the dried fruit of a plant in the parsley family. It is very aromatic and imparts a slightly bitter taste. It is used in Moroccan cooking to season eggs, some tagines and stews, grilled and roasted meats, beans, salads and more. Cinnamon is a fragrant, sweet spice which comes from the bark of the cinnamon tree. 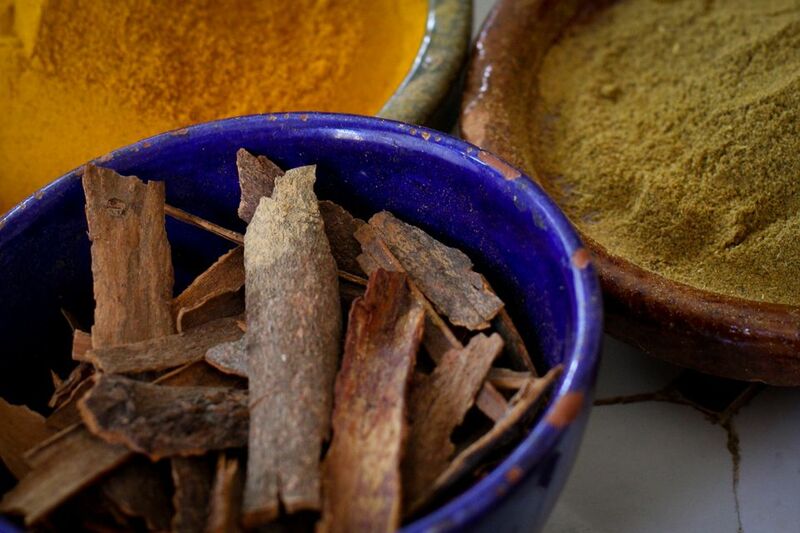 Moroccan cuisine makes use of both ground cinnamon and pieces of the ground bark (quills, or sticks). Cinnamon is most common in Moroccan pastries and sweeter dishes, such as those that combine meat with fruit, but it’s also used in harira. Saffron threads are the cultivated stigmas from the saffron crocus flower. They are very fragrant and only a few threads are needed to impart a yellow color, wonderful aroma and distinctive taste to dishes. Saffron is known to be expensive, but it is much more affordable in Morocco and other Mediterranean countries than in North America. Middle Eastern markets frequently carry it at more reasonable prices than grocery stores. This is a bright orange powder that is used alone or with turmeric to give Moroccan dishes a yellow color. The colorant has no aroma and no taste and is probably not widely available outside of Morocco. If you use it, watch out—it’s messy! I've migrated away from it in recent years as it's artificial; I tend to use only turmeric instead. Although turmeric is primarily used to impart a yellow color to Moroccan food, it does have an earthy aroma and slightly bitter taste. It comes from the ground roots of a plant called Curcuma longa. Moroccans frequently use both turmeric and an artificial colorant in a single recipe. However, turmeric fine to use alone if you can’t obtain the Moroccan yellow colorant or want to avoid artificial colors. The name translates to “head of the shop” and it's a mixture of ground spices. Recipes for Ras El Hanout vary, but they frequently include cardamom, nutmeg, anise, mace, cinnamon, ginger, various peppers, and turmeric. Anise seeds have a distinct licorice flavor and are used sparingly in Moroccan cooking and baking. Ground anise is also used. Sometimes fennel seed may be used in place of anise and vice versa. Sweet and spicy, this aromatic spice is found in a spice blend called Ras El Hanout. Less frequently, it is used to season savory dishes. Ground nutmeg comes from the seed of the same fruit which yields mace. Golden, un-hulled sesame seeds are used in Moroccan cuisine, not the hulled white seeds that are more common in the United States. They are very nutty in flavor and used primarily in baking, although they are surprisingly good as a garnish on some dishes. Arabic gum is actually the hardened sap of the acacia tree. It is ground and used in some Moroccan recipes as a stabilizer. Fenugreek seeds, known as helba in the Arabic world, are golden in color and have a strong aroma. Although the seeds are bitter when chewed, they impart a unique, sweet essence to dishes. They're used in a limited number of Moroccan dishes, most famously in rfissa. Whole bay leaves might be used in stews, tagines, and tomato sauces. They are very fragrant and mildly spicy and come from a variety of evergreen tree.